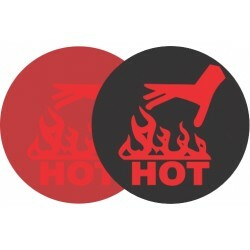 The Hand Hot temperature safety indicators provide a clear and distinct warning that a surface is hot to touch by changing colour when a surface temperature reaches and exceeds 50°C. These indicators are self adhesive and a must for OHS. They are used by peeling from their backs and placing on the surface in question.